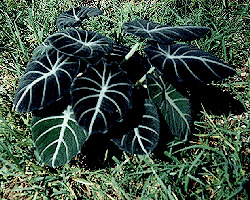 This is apparently a recently dicovered species alocasia (supposedly from Borneo), but already available commercially, sometimes in such unlikely places as Home Depot or Orchard Supply Hardware. It is very susceptible to spider mites. I also think it prefers high humidity. 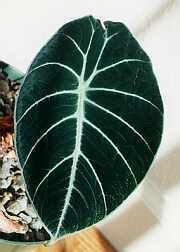 My plant has never been as gorgeous as the one below. I think I'll try building a mini-greenhouse for it. And this is a pathetic little single-leaved plant I am trying to grow. 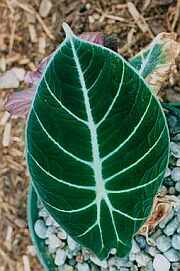 This is a brand new leaf, and therefore has quite a lot of green color in it. Same plant, couple months later, still one leaf. This one has matured to nearly black. Perhaps in response to my continuing unsuccessful attempts to induce it into lush growth, the plant decided that it's time to reproduce before I kill it, and started making inflorescences instead of leaves. This is the second one of them, all of 1 inch tall. 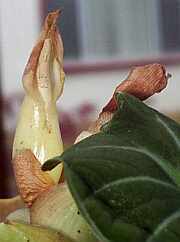 Same inflorescence, cut open for a closeup of the flowers.